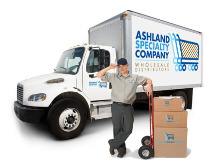 Ashland Specialty Wholesale Distributors Company and warehouse is located in the heart of the Tri-State area at Ashland, Kentucky. We are convenience store wholesale distributors for a multitude of nationally known brands with a well established clientele of grocery store and convenience store locations throughout an approximately 150 mile radius from Ashland, Kentucky. We are convenience store wholesale distributors to many counties in West Virginia and Ohio.